Thermal Product Solutions, a global manufacturer of thermal-processing equipment, announced the shipment of a Granulation Dryer to a manufacturer of pharmaceutical and nutritional products. Thermal Product Solutions, a global manufacturer of thermal-processing equipment, announced the shipment of a Granulation Dryer to a manufacturer of pharmaceutical and nutritional products. This single pass granulation dryer is designed to dry 150 liters of water from pharmaceutical granulation. The maximum temperature rating of this pharmaceutical dryer is 150°F, and the work chamber dimensions are 74” W x 185” D x 74” H.
The granulation dryer body is 304L Stainless Steel and is designed with NFPA 86 Class “A” construction. The drying system can accommodate 1440 lbs. of product on 240 trays that are loaded via 6 trucks. Gruenberg, a division of Thermal Product Solutions, LLC, is recognized as a leader in the design and manufacture of a comprehensive line of standard and custom industrial batch and conveyor ovens that accommodate temperatures up to 1200⁰F. Gruenberg products are known for their durability, innovation, and superior performance. 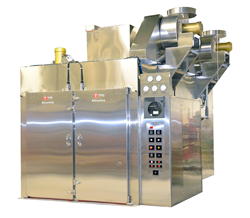 Additional products offered by Gruenberg include custom pharmaceutical ovens, depyrogenation ovens, granulation dryers, pharmaceutical sterilizers, and lab animal science sterilizers.